Limbo is a Roman Catholic theological term, referring to the concept of a spiritual realm where the souls of righteous people who lived before the time of Christ could dwell until Jesus Christ made it possible for them to enter Heaven. A similar concept was used to describe the spiritual state of children who died before they could receive the sacrament of baptism, which the Church regarded as a necessary condition for entering Heaven. The Roman Catholic Church has never endorsed this concept as an official doctrine. The Roman Catholic concept of limbo developed as a result of two dogmatic principles of Catholic faith, that all humans are born with original sin and that the sacrament of baptism was necessary in order to receive salvation and enter Heaven, where the souls of the just experience immediate knowledge of God in perfect happiness. The provincial Council of Carthage (418) declared that, “without baptism, they cannot enter the kingdom of heaven which is eternal life.” These doctrines presented two difficulties. Prophets and religious fathers of the Old Testament, who had lived in righteousness and were surely deserving of salvation, had preceded Jesus and therefore had never been baptized. Did this mean that they were to be eternally excluded from happiness in the knowledge of God? The other problem was the situation of infants and children who died before they could be baptized. These children were considered innocent because they had not had the opportunity to commit personal sin, but still had original sin. Would a just and loving God condemn these innocent children to eternal suffering in Hell? The concept of “limbo” does not appear in the Bible, nor was it ever officially endorsed by the Roman Catholic Church. Nevertheless it was widely accepted that limbo existed as a temporary dwelling place where the souls of the just, who died before the resurrection of Christ, could wait in happiness for the establishment of the Messianic Kingdom, when they would enter a condition of final and permanent bliss. Theologians interpreted various statements made by Jesus Christ in the New Testament as references to a place or state which Catholic tradition called the limbus patrum (limbo of the fathers). Matthew 25:1-11 Parable of the five foolish and five wise virgins waiting for the marriage feast. In Ephesians 4:9, Paul teaches that, before ascending into Heaven, Christ "also descended first into the lower parts of the earth," and Peter (1 Peter 3:18-20) teaches that "being put to death indeed, in the flesh, but enlivened in the spirit," Christ went and "preached to those souls that were in prison, which had been some time disobedient, when they waited for the patience of God in the days of Noah." Medieval drama sometimes portrayed Christ leading a dramatic assault, "The Harrowing of Hell," during the three days between the Crucifixion and the resurrection. In this assault, Jesus freed the souls of the just and escorted them triumphantly into heaven. This imagery is still used in the Eastern Orthodox Church's Holy Saturday liturgy (between Good Friday and Pascha). The concept of the limbo of the fathers (limbus patrum) is that people who lived good lives but died before Jesus' Resurrection did not go to heaven, but rather had to wait for Christ to open heaven's gates. This concept of limbo affirms that one can get into heaven only through Jesus Christ but does not portray Mosesand other Old Testament figures as being punished eternally in hell. The foundational importance of the sacrament of baptism (using water) or the non-sacramental baptism of desire (justification through experiencing repentance and a strong desire for baptism) or baptism of blood (martyrdom) in Roman Catholic theology gave rise to the argument that the unbaptized are not eligible for entry into Heaven, because the original sin of human nature precludes them from the immediate knowledge of God enjoyed by the souls in Heaven. Since infants are incapable of either professing their faith or performing acts of Christian charity, the only means through which they might receive the grace of justification required for salvation is baptism with water. There was a question about whether infants who died before being baptized could be saved. Early Church writers, notably St. Augustine, considered that unbaptized infants were excluded from heaven, and thus went to hell. 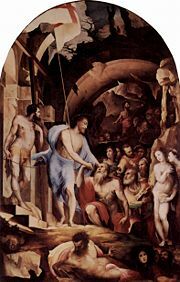 Many Roman Catholic theologians believe that unbaptized children, as well as others lacking the use of reason, go to "the limbo of children" (limbus infantium or limbus puerorum) after death; limbo is a sort of intermediate state, in which souls are denied the immediate knowledge of God, but saved from the torment of hell. Thomas Aquinas described the limbo of children as an eternal state of natural joy, untempered by any sense of loss at how much greater their joy might have been had they been baptized. He argued that this was a reward of natural happiness for natural virtue; a reward of supernatural happiness for merely natural virtue would be inappropriate since, due to original sin, unbaptized children lack the necessary supernatural grace. The sixteenth century theologian, Cajetan, suggested that infants dying in the womb before birth, and so before ordinary sacramental baptism could be administered, might be saved through their mother's wish for their baptism; attempts to have his theory condemned as heretical were rejected by the Council of Trent. Protestant and Orthodox denominations do not accept the existence of limbo; it is a Roman Catholic concept. Martin Luther and others have taught that the souls of those who have died are unconscious (or even nonexistent), awaiting their destiny on a future Judgment Day. The Zoroastrian concept of hamistagan is a neutral state in which a soul that was neither good nor evil awaits Judgment Day. In the Divine Comedy, Dante depicts limbo as the first circle of Hell, located beyond the river Acheron but before the judgment seat of Minos. The virtuous pagans of classical history and mythology inhabit a brightly lit and beautiful, but somber, castle which is seemingly a medievalized version of Elysium. In the same work, a semi-infernal region, above limbo on the other side of Acheron, but inside the Gate of Hell, is the "vestibule" of Hell and houses so-called "neutralists" or "opportunists," who devoted their lives neither to good nor to evil. In literature, the name "limbo" is sometimes applied in a wider sense to a place or state of restraint, confinement, or exclusion, and is practically equivalent to "prison." In Henry VIII, Shakespeare uses “limbo of the Fathers” to signify prison. In the Italian Renaissance poet Luduvico Ariosto's Orlando Furioso (1532), the knight Astolfo visits the moon's Limbo and discovers all of Earth's wastages: Talents locked up in named vases, and bribes hanging on gold hooks. Samuel Taylor Coleridge uses “limbo” to describe the waking nightmares of an opium addict: "The sole true Something—This! In Limbo's Den/It frightens Ghosts, as here Ghosts frighten men." Taken from the original meaning, in colloquial speech, "limbo" often refers to a place or state of restraint, confinement or delay, such as the situation of a project which is halted pending action by another person. A "legal limbo" may occur when conflicting laws or court rulings leave a person without legal recourse. ↑ St. Augustine, On Merit and the Forgiveness of Sins, and the Baptism of Infants. Retrieved March 22, 2007. ↑ Dictionnaire de Théologie Catholique, Volume 2, columns 305-6. ↑ Jimmy Akin, Limbo In Limbo? Retrieved March 22, 2007. ↑ Religious Tolerance, Limbo: Recent statements by the Catholic church; Protestant views on Limbo. Retrieved March 22, 2007. Heaven and Hell in Christian thought Stanford Encyclopedia of Philosophy. Dyer, The existence of Limbo: a common doctrine from which it would be rash to depart... These Last Days Ministries, December 28, 2005. Brian Harrison, Could Limbo Be 'Abolished'? Seattle Catholic, December 7, 2005. John Hooper, Babies to be freed from limbo The Guardian, November 30th, 2005. This page was last modified on 23 July 2018, at 14:09.